It’s Monday, and you know what that means: Menu Plan Monday! This week is extra fun for me because I am hosting the Gluten Free Menu Swap. The theme ingredient I picked was greens. There are so many types available for fall. I like to get them in the menu before a big freeze finishes off my garden supply. I hope everyone had a fun Halloween night. I LOVED the fact that it was on a Friday this year AND my kids had an early release day, so it was nice not to have to rush around. 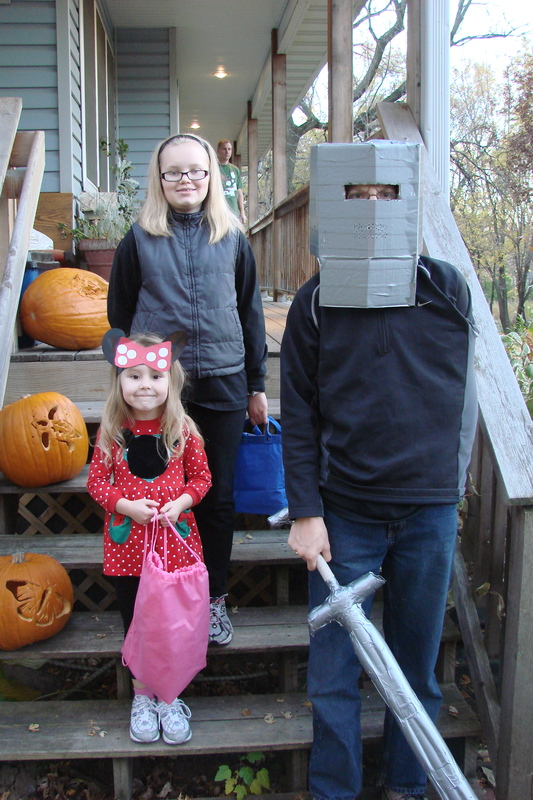 My kids were: the Monty Python Black Knight (he hung out with two friends who were an executioner and King Arthur. Ha, ha, ha! ), a secret agent and Minnie Mouse. 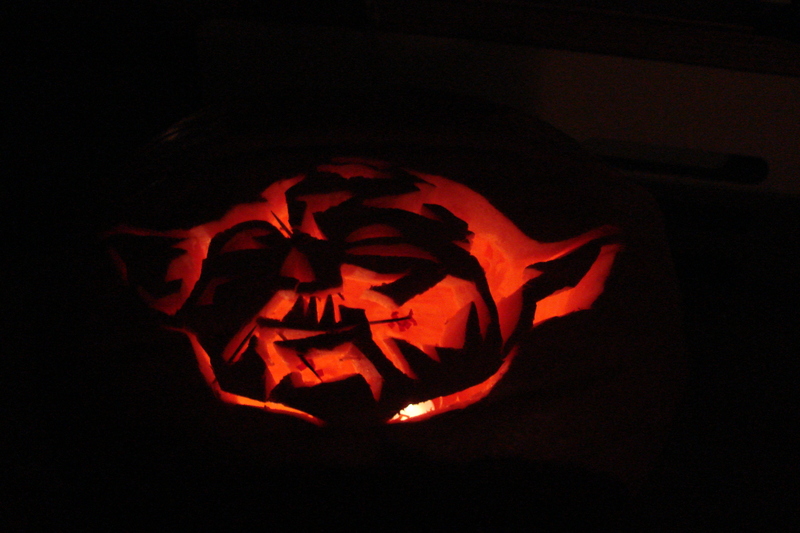 My son carved a very elaborate pumpkin this year of, who else, Yoda. (Remember his birthday cake? 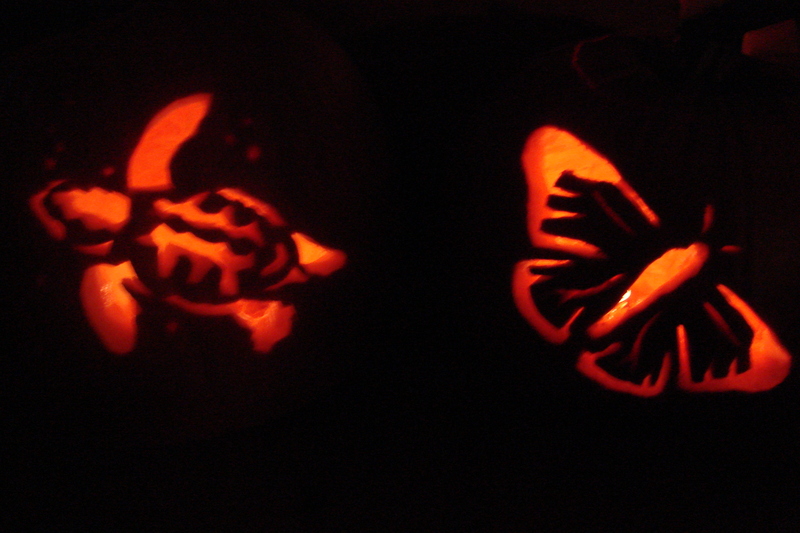 Yeah, I am sensing a theme…) The girls had a sea turtle and monarch butterfly. We found the templates for the animals on the WWF website. Very cool! Head over to the Organizing Junkie for Menu Plan Monday. And come of back see who is contributing to the Gluten Free Menu Swap. I can’t wait! After a trip to the farmer’s market, (she got FRESH curry leaves! I am so jealous!) Asparagus Thin has an amazing menu with Asian Yam Salad, Broiled Catfish, Korean Tofu Vegetable Stew and Gingerbread Snack Bars. I can’t wait to see how she does gluten free seitan! You can bet I will be checking back for that. Kimberly of Gluten Free is Life is taking it a bit slow an easy this week as she is still recovering from surgery and not up to chewing anything to tough yet, like greens (sorry, Kimberly!). She has some nice comforting foods such as spaghetti and butternut squash, grilled and roast chicken, french toast and pizza. I think I need to stop over! I am super excited that she got a great care package full of gluten free mixes. Let us know how the Soft Pretzel’s from Miss Roben’s bakes up, okay? I hope you feel better soon! 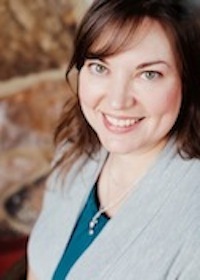 Cheryl at Gluten Free Goodness is a nutritionist in her “real life.” This week’s menu contains links to her fabulous gluten free Thanksgiving newsletter which includes the GF status of different turkeys and a list of over 30 GF recipes for your Thanksgiving day feast. All that and her menu features kale with beans, artichokes with a lemony-thyme sauce (I am hoping she shares that one! ), beef stew in coconut milk and a pear spice cake. Sea at the Book of Yum will be eating well this week. Vegetarian Moussaka, Garlic Mushroom Pastries, and American Vegan Leek and Been Cassoulet are all on the menu. Her baking will include GF cinnamon walnut rolls and potato lefkes. She on a real baking kick (must be the time of year. Yay! ), so I’ll be keeping an eye on her blog for more baking adventures! Fresh Ginger planned her menu in honor of election week to reflect the nationalities that form our nation. There are Italian, all American, Hungarian, Mexican and Chinese dishes lined up for her table. Everything from pork braised in milk, rosemary and garlic, pheasant and wild mushroom pot pie, chicken paprikash (Yum! ), and Black and Szechuan pepper chicken. Delicious! 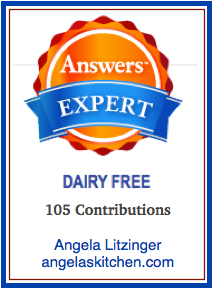 Mary Frances at Gluten Free [Cooking School] has two weeks planned in order to better estimate her grocery budget. She has several amazing soups on the menu (mmm…soup…), Chickpea & Dumplings, Spinach and Tofu Onigiri. She is planning on doing some trial runs on some Thanksgiving side dishes, so we will have to keep an eye out for that! Rachel at All She Is has a menu ready for when the snow flies (in a week? I need to find my mittens pretty quick!) with rotisserie chicken, maple & sage glazed pork tenderloin, a crock pot roast and lots of tasty sides: hot crash potatoes (yum! ), green beans, snow peas, salads, maple glazed carrots, biscuits and brownies. Kimberly of Living Free has been enjoying exploring new SCD recipes such as a Mexican Chicken Stew, meatloaf, mashed cauliflower (my kids LOVE that – yummy), shepherd’s pie with butternut squash for the topping. She also has carrot fritters on the menu which really intrigue me. And guess who’s birthday is on Thursday? Happy Birthday Kimberly!! Be sure to check back at Gluten Free Goodness for the temporary swap headquarters for Gluten Free Mommy. I hope you are feeling better soon, Natalie! Looks like next week’s host is Gluten Free Goodness and the theme is pomegranate. To make this week: The amazing Coconut Dulce de Leche from Epicurious. Oh, yeah, baby! It’s not just greens around here. I think I need to make a BIG batch… mmmm…. I have plans for this later in the week and for Thanksgiving. Being as this stores for up to a month in the refrigerator, I can make it now. This clever caramel sauce is made from coconut milk instead of the usual condensed milk. SERVING SUGGESTION: Over vanilla ice cream sprinkled with toasted coconut. Whisk coconut milk, sugar, and coarse salt in heavy large skillet over medium heat until sugar dissolves. Increase heat to medium-high and boil until mixture is reduced to 2 1/2 cups, stirring occasionally, about 20 minutes. Transfer sauce to small jars. Cool completely, then cover sauce and chill. DO AHEAD: Can be made 1 month ahead. Keep chilled. Hi!! Thanks so much for hosting this week! Here is my gluten-free menu plan for the week...I just had surgery, so I wasn't able to use the ingredient of the week.... http://glutenfreeislife.wordpress.com/2008/11/03/menu-plan-november-3-2008/ Thanks! 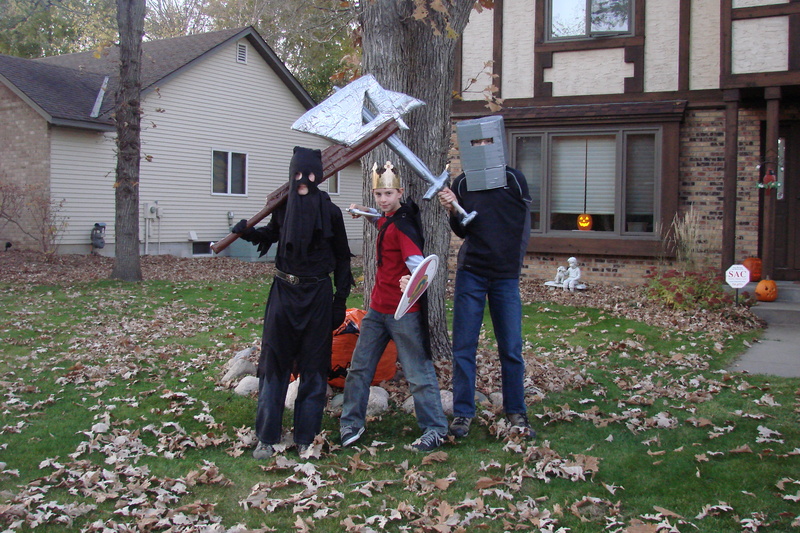 Now you're killing me....seriously.....first with THE BLACK KNIGHT...omg, could it be any better than a 13yo who wants to be THE BLACK KNIGHT! Most kids his age would look at him and go 'Huhhhh?' without totally understanding how hysterical that is. And Minnie Mouse? Cuter than cute, esp. being your little girl who is so darn cute anyway. I had a Minnie Mouse visit me on Friday too. A Secret Agent? With the blond hair and the huggability factor, that girl has a future in the CIA, for certain. She could bring down criminals just with her personality. But then, the dulce de leche.....come on over with some and a spoon, K? G-man is also going on the retreat this weekend. We should share pick-ups and drop-offs. Lemme know! Kate and Ginger: I know, isn't the Monty Python thing hysterical?!?! Kate: let's chat about the carpooling thing. Could you drop and I pick up? I'll call you tomorrow... Kate and Sea: I pretty much want to fill a bathtub up with the coconut dulce de leche... mmmm... Sea: the temp headquarters are at Gluten Free Goodness. I linked it in today's post now. I hope that helps! Cheryl: the turtle was so fun to carve! Thanks for hooking me up to host this week. It has been a lot of fun! Mine is up too. Thanks for hosting this week!